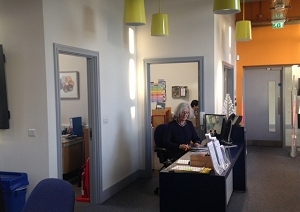 Whittington Health Library offers a comprehensive and modern library service to NHS staff from Whittington Health, Camden and Islington NHS Foundation Trust, Islington CCG and Primary Care. Book loan and IT services are also provided to UCL students working at Whittington Health, as well as study space and IT services for Middlesex University students on placement at the hospital. The library is based in the Highgate Wing of the hospital on Dartmouth Park Hill. We are close to several transport links, making it easy for you to visit. The library collection covers areas such as medicine, nursing and mental health. There are quiet study and reading spaces, a computer area and a dedicated training room which can be booked for meetings. As well as traditional library services we also offer further information resources online. To view which journals are available to you through NHS Athens, and access their full text, Click here to go to the �My Journals� page� (Sign-in with your NHS Athens username/password). To search databases including Medline and CINAHL, Click here to go to the �Healthcare Databases Advanced Search� page (Sign-in with your NHS Athens username/password). Our members needs are central to how we approach the service and we invite your suggestions and contributions to ensure that you, the user, are receiving a service that is relevant. Our goal is to support you in the work that you do, in your learning and development and any research activities that you may undertake. KnowledgeShare is Whittington Health Library�s new targeted current awareness service for NHS staff members. Tell us about your professional interests and we will set you up to receive a regular bulletin of the latest high-level evidence in your field. This will come in to your specified e-mail address every 2 weeks. Either Click here for a KnowledgeShare form and return it with as much detail as possible to whl@nhs.net, or self-register at https://www.knowledgeshare.nhs.uk/ using your NHS Open Athens username and password.